If you're curious about the height of a tree, you don't have to climb it to measure it. 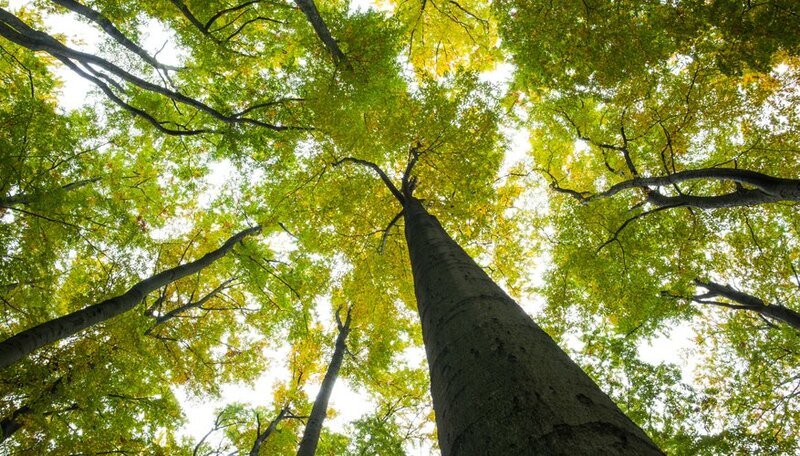 A variety of methods work for estimating a tree's height without measuring it directly. Landscapers frequently need to calculate the height of a tree before felling it. One method uses the height of a stake, the length of its shadow and the length of the tree's shadow. This shadow method relies on the fact that the ratio of an object's shadow and its height is the same for all objects in a given place and time. Place a stake in the ground next to the tree so that the tree's shadow does not obscure the stake's shadow. Ensure the stake is far enough into the ground that it does not move easily. Measure the exposed length of the stake with a tape measure. Assume for this example that the exposed stake measures 4 feet in height. Measure the length of the stake's shadow from the base of the stake to the tip of the shadow. Assume for this example the stake's shadow is 3 feet in length. Measure the length of the tree's shadow from the base of the tree to the tip of the shadow. Assume for this example the tree's shadow is 27 feet in length. Divide the length of the stake's shadow by the height of the stake to find the ratio between an object's shadow and its height. The shadow of the stake is 3 feet and its height is 4 feet long in this example, so the ratio between the stake's height and its shadow is 3 divided by 4, or 0.75. Divide the length of the tree's shadow by the ratio between an object's shadow and its height to obtain the height of the tree. The tree's shadow is 27 feet long in this example and the ratio between the length of its shadow to its height is 0.75. The height of the tree is therefore 27 divided by 0.75, or 36 feet.